Outcome measures, or PROMs (patient-reported outcome measures) are clinically validated tools used to objectively establish the baseline function of a patient. The same tool will be used at various points through a treatment period, and often some time after, to establish the progress of a patients recovery, and the efficacy of treatment. Determining a patients recovery times. Assessing the quality of care a patient receives. Until now, clinicians have often found it challenging to incorporate outcome measures into their day to day practice, owing to their time restricted schedules, and the sometimes lengthy PROM’s used. Physitrack makes it easy to incorporate and analyse this data. 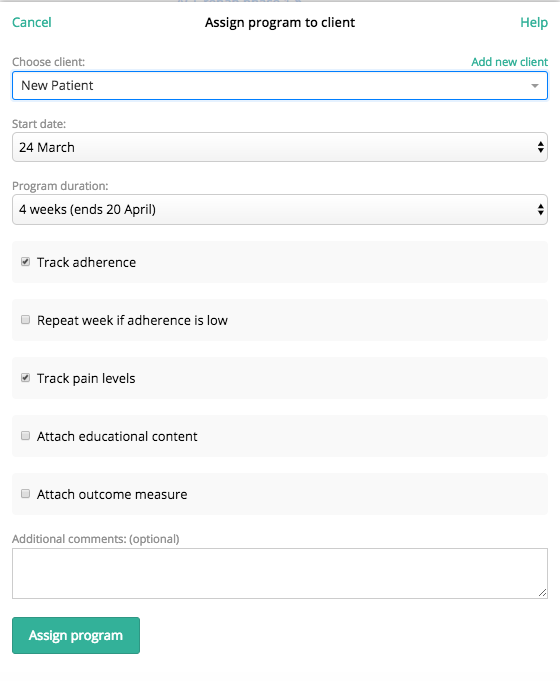 Simply assign the relevant outcome measure to your patients treatment program. Their outcome measure will pop up when they login to PhysiApp. This allows the patient to complete the PROM in their own time. You can assign an outcome measure to a patient as standalone (without exercises), or as part of an exercise program. To assign an outcome measure as standalone (i.e. without exercises), simply go to Library > Outcome measures, and select the outcome measure that you want to send. 1. When you are in the program editor (i.e. after you've clicked the exercise basked), click the “ Assign” button. 2. If not already selected, choose your patient. 3. 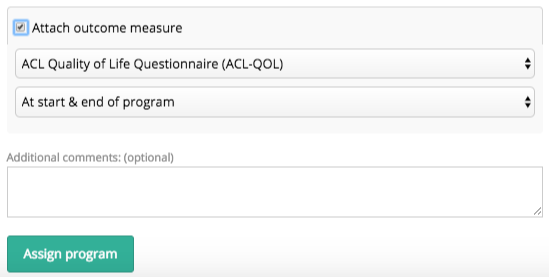 Select “Attach outcome measure” at the bottom of the assign page, and chose the PROM you wish to send, and when you would like it to be complete. 4. Finally, click “ Assign program”. For more information on how to view outcome measure data, and how to create your own questionnaire, watch our pre-recorded webinar.